A while ago I downloaded an album, added it to iTunes with a bunch of other albums and carried on. Later, said album showed up as Unknown Album, Unknown Artist, Unknown Tracks. I have no clue who it is. Take a listen and help a brother out. Upon a short but trusted recommendation from Gruesome Greg (ie a tweet) I decided to give Atlanta's Sons of Tonatiuh a listen. Their second album, Parade of Sorrow blew the doors right off my barn. Following the sludgy intro, “White Wall” erupts with bassist/vocalist Mike Tunno screaming the song title with all the pain of a chainsaw victim. His wail is only one aspect of SoT's multifaceted approach. I envision Sons one day finding a home with Hydra Head Records. Not only would they fit on that label stylistically but Parade of Sorrow has as many voices as the mythological Hydra itself. In addition to the aforementioned sludge (very little surprise coming from Georgians. Not to stereotype.) 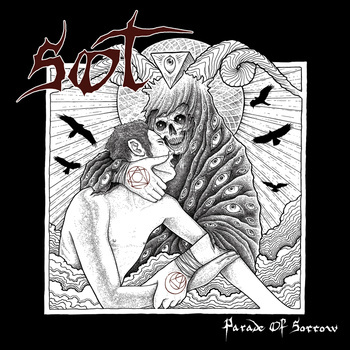 SoT bring doom and punk rock in to the fold. One moment plodding along crushing anything in their path with Godzilla-like weight, the next pounding out that unmistakeable punk beat while telling tales of social injustice both new and old. It may sound like this mix of styles may detract from the albums cohesiveness, especially given how quickly they can shift between them but that is far from the case. Across the entire album, the tone, the feel of the output remains intact. It's only natural that the many heads of the Hydra are fed with blood from the same heart. I keep making reference to myths of old but Sons of Tonatiuh are far more current than that. Along with guitarist/vocalist Dan Caycedo and drummer Tim Genius, SoT bring a social consciousness to a genre I've not recognized much in. Sludge and doom tend to be more personal or existential. Blending the punk element in both a lyrical and stylistic way makes it different. However, they do so without it sounding like an overt protest song. There is so much aggression behind it that you really need to read the lyrics. And THINK. Of course, you may be too busy tearing down the walls of whatever establishment you find yourself in, but when you're done, know that Sons of Tonatiuh are more than just crushing doom, syrupy sludge and righteous punk. For the record, it's pronounced “Tahn-ah-tea-ah”.